I completely and utterly devoured this book. 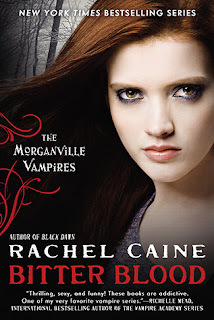 I've followed along with The Morganville Vampires series since the beginning and damn, I'm glad I did. Thirteen books in and Rachel Caine still manages to surprise us and literally keep us on the edge of our seats. There is definitely a lot to process from this book and I sat there for like five minutes after I finished, just digesting. So here's my review. You would think that after the draug are taken care of, that our heroes could have some peace but that is not the case. A character from the past makes her reappearance and goddamn does she cause problems. I really love how Claire has grown. She went from a timid girl to one who isn't afraid to fight for all she wants and isn't afraid to get hurt to protect the ones that she loves. And we all know she loves Shane, Michael and Eve with all her soul. This book broke my heart in some places, especially when Michael under influences(that will not be spoiled here) causes a rift between all the members of the house. Unfortunate as this was, we see that Claire is truly strong and truly ready to face the challenges thrown at her. Oh, Myrnin, my favorite wacky vampire. He didn't play as important of a role but he was crucial to the storyline. I'm glad he cares for Claire but seriously he's a little too old for her. He will always be her black knight but her black knight is not exactly what she needs. It was very interesting to see the ghosts and humans of Morganville really have a role in the town. It was nice to see their strength but honestly, even given the circumstances, it doesn't give most of them the right to be asses. Michael and Eve are married and it should of been a happy thing but they don't exactly have everyones blessing and this paints the whole glass house as targets. Their love is strong enough to survive but it really is them against the world. Oh, I still respect Amelie but she pissed me off in the beginning of the book. It was like one of those people that you want to shake them until some sense dawns on them. I give Bitter Blood a 10/10. I loved it. It wasn't flawless because there are some falters of pace but I loved the multiple point of views, the wittiness that Rachel Caine manages to stick in there and the tying of the characters together even more strongly.